This photo essay re-introduces Nature Change readers to a very old way of enriching our soils while managing the disposal of wood wastes. 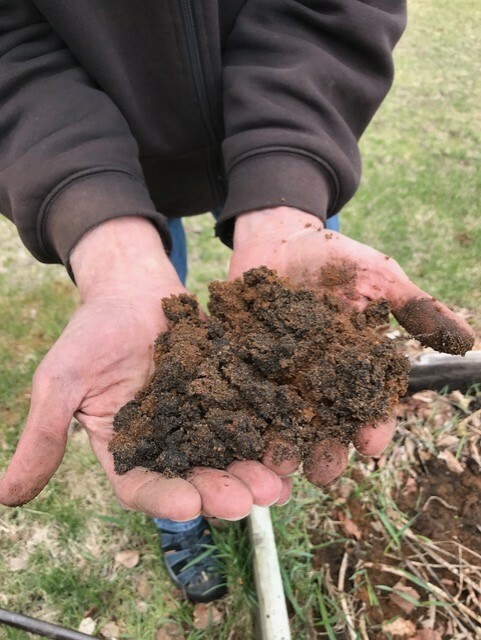 Please read on as author, teacher and bioregionalist, Stephanie Mills takes us to Northport to meet soil scientist and biochar advocate, Tim Overdier. We thank Diane Kraus for the photography. All I knew of Tim Overdier, a retired soil scientist, was that he wanted to get the word out about biochar, a soil amendment, which he describes as a “high potential climate change mitigation and adaptation tool.” I guessed he might be an extroverted rationalist, a booster type, and as I drove up towards his place, I braced for a spiel. It was a cold but sunny day in April. On my arrival his big fluffy dog Kita, looking half Samoyed, half Shepherd, bounded out of the garage. Overdier, who appeared a minute later, said she’s actually a Native American breed. Theirs was a friendly, genuine welcome. Slender and calm, Overdier proved to be reserved, if not shy, with a ready, happy laugh. He invited me into the big garage that is both a woodshop and library, its walls lined with shelves of books concerned not just with soil and woodworking, but with philosophy, Jungian psychology, and Christian mysticism. “Books are like oxygen to me,” Overdier said as I gazed at the titles. He led the way into a back section of the garage where he does woodcarving. A score of cowled, tapering statues of St. Francis of Assisi gazed soulfully out from another wall of shelves. Elsewhere in this maker space were a woodstove and some stuffed armchairs, a cozy chess hangout for the young seasonal workers–millennials–he welcomes camping on his land north of Northport. Tim Overdier grew up in small towns in Wisconsin. His father was a Lutheran minister and his mother a nurse. Heeding the call to service must be in his blood; service to the soil is service to life. He sought, in the early 80s, an internship with Oregon’s Tilth, an organization pioneering organic farming. 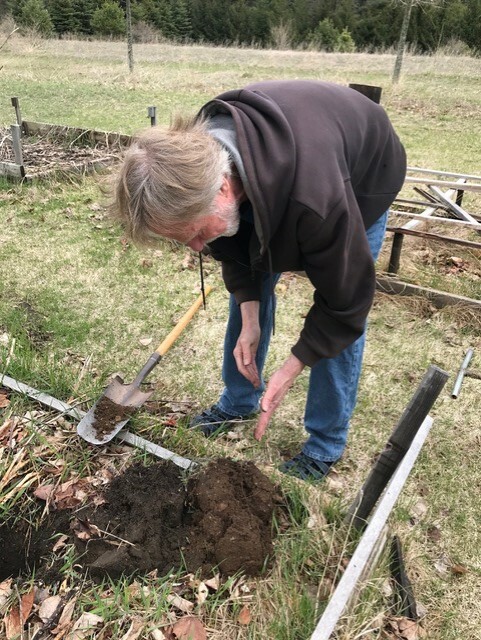 He wound up working as a soil scientist in the Bureau of Indian Affairs—made “a career of looking at dirt.” He spent many years sampling and mapping soils in Navajo Land and on the Jicarilla Apache Reservation–arid, sparsely populated, wide-open landscapes, the antitheses of the moist, rippling countryside that is Leelanau County. Here he’s taken up a mission to promote biochar, charcoal used as a soil amendment. Our ice age soils are sandy and new, and after the land was logged and the old growth forest duff and humus were exhausted they were easily depleted. Regeneration and development are called for, and biochar, a venerable remedy, can help. It was use-tested in the Amazon Basin for hundreds of years: There’s strong evidence that biochar in the deep dark soils known as terra preta helped underwrite centuries of Amazonian civilization. Those soils, rich in charcoal and still healthy, along with archeological traces of flourishing settlements so testify. They tell quite a different story from the desertified landscapes of the formerly Fertile Crescent, whence Western civilization was launched. “Air samples trapped thousands of years ago reveal increases in green house gases that correspond with the rise of farming in Mesopotamia,” writes Moises Velasquez Monoff in the April 18, 2018 New York Times Magazine. In 21st century retrospect, it seems that deforestation and agriculture may not have been the best things for this or any land, or the climate. Even before fossil fuels launched the industrial revolution, felling the trees and plowing the ground liberated immense amounts of carbon. As the severity and momentum of global warming become undeniable (except by folks vested in fossil fuels) various grandiose, if speculative technological fixes, termed geo-engineering, are being proposed and in some cases launched by freelance tycoons. They include ideas like cloud-seeding, ocean fertilization, deploying a haze of tiny reflective particles to increase Earth’s albedo, and costly, unproven underground storage of CO2 from coal-fired power plants. They might work. If not, the unintended consequences could be catastrophic: One Earth, One Experiment. Only evolution and a few million years could manage the do-over. Yet scientists are virtually unanimous in warning that the climatic consequences of today’s rising levels of greenhouse gases are civilization-threatening at the least and biosphere-threatening at worst. Therefore, not only must we curtail atmospheric greenhouse gas emissions, we must begin to remove and sequester them. Plants inhale carbon from CO2 to build their tissues above and below ground. Long-lived plants, like trees, are nature’s own carbon vaults. Made, immemorially, from wood and other organic matter heated in absence of air, often in kilns, charcoal is a natural carbon sink, durable, inert, and adsorbent: It’s able to hold gas and other molecules on its surfaces. In addition to stashing carbon away, biochar builds soil fertility by encouraging the galactic arrays of micro-organisms on which it depends. Mixing charcoal with organic nutrients like compost, manure, or urine before adding it to the soil seems to enhance its effectiveness. Because biochar retains the complex microstructure of the organic matter it’s made from, “It’s like condominiums for soil microbes,” says Overdier. Biochar also improves soil moisture retention, and as global warming portends more droughts, that, too, is crucial. 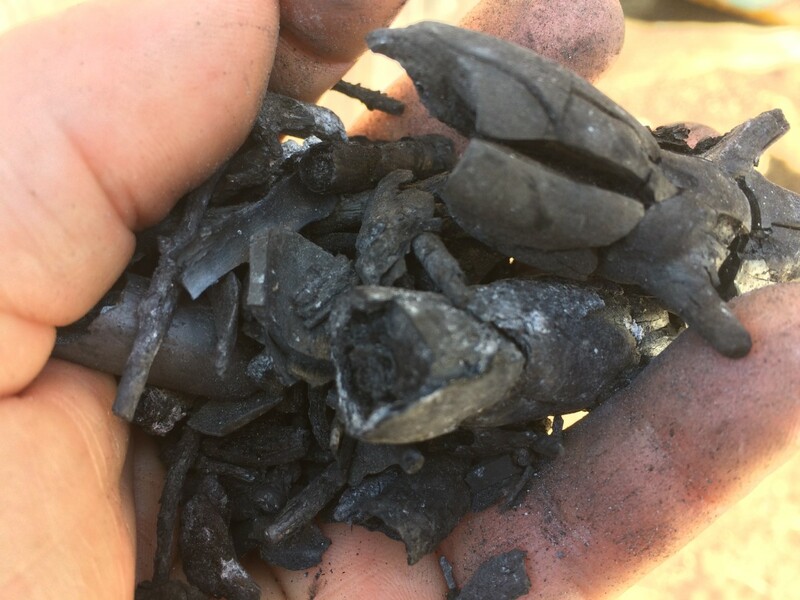 Tim Overdier posits that local production of biochar from plant materials now going to waste could play a part in conserving natural resources, reducing atmospheric greenhouse gases, and improving our soils. 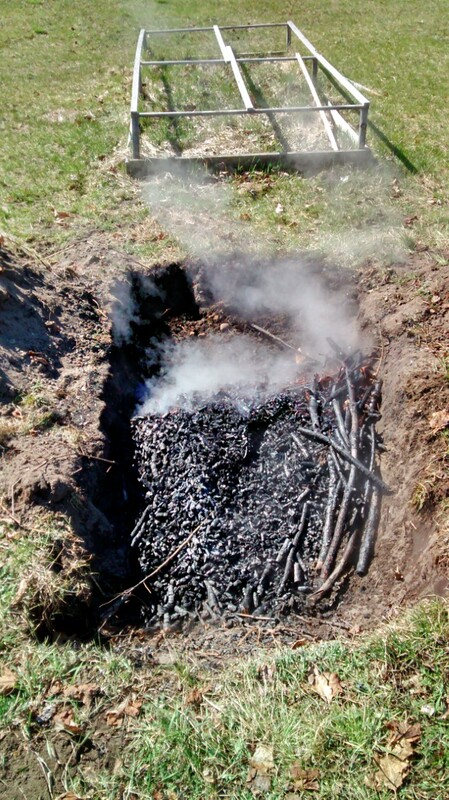 Rather than smokily burning orchard and other tree trimmings down to ash, turning them into biochar might add some longevity to our civilization. We went outside, where Overdier showed us the makings of a mobile biochar kiln—two salvaged home heating oil tanks to be halved lengthwise and bolted together and mounted on wheels. This thrifty piece of bricolage could travel to sites to add value to, rather than destroy, biomass like orchard prunings, mill trimmings, or crop waste. Around the world, technologically advanced biochar production by corporations and municipalities is underway. However, as the biofuels boom cautions, the distortions of agriculture and land use caused by rapid, outsized conversion of cropland to feedstock production can undermine the welfare of bioregions. Happily, biochar can be produced in many ways and at many scales. A gardening friend of mine nearby makes a little biochar in his woodstove using a tight, stainless steel canister as a mini-kiln. 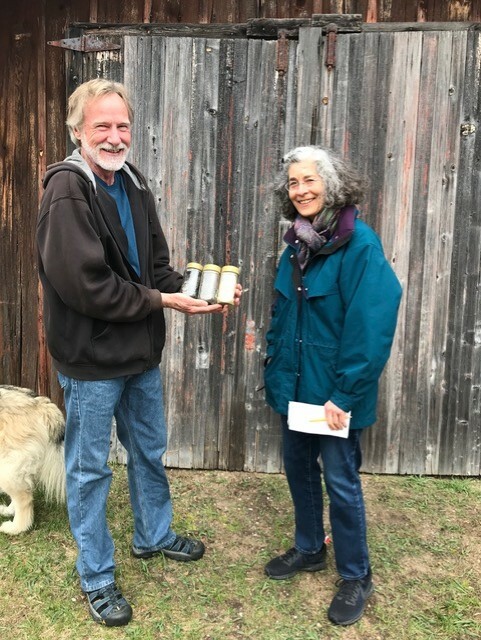 Another friend, Albert Bates, a climate activist and permaculturalist, author of the comprehensive The Biochar Solution: Carbon Farming and Climate Change, charges his home-made biochar with hyperlocally produced urine. Overdier showed Ross and me his own bin of biochar, made simply by burning tree trimmings from the top down in a trench, then quenching the coals. The matter has its own inky, lustrous beauty. “Do you keep that locked up at night?” asked Ross, jokingly. Like countless Earth activists around the world, Tim Overdier is making a beginning where he is with what he knows. 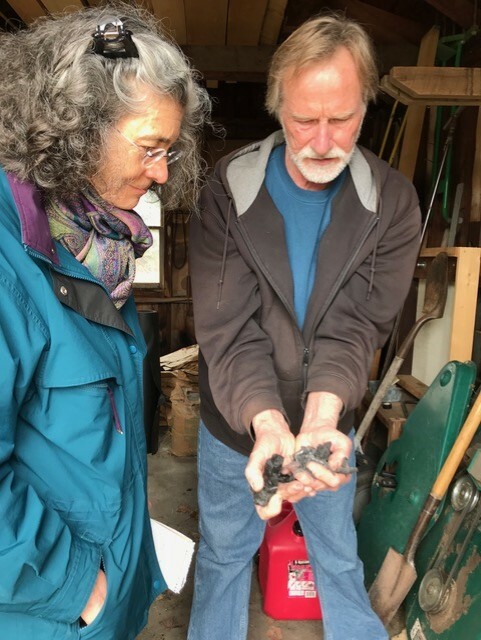 He has proposed a pilot project in Northport and Leelanau Township to manage tree wastes: pull out cordwood for the needy, preserve the best pieces for art, produce biochar, and collect scientific data to demonstrate soil improvements from biochar. 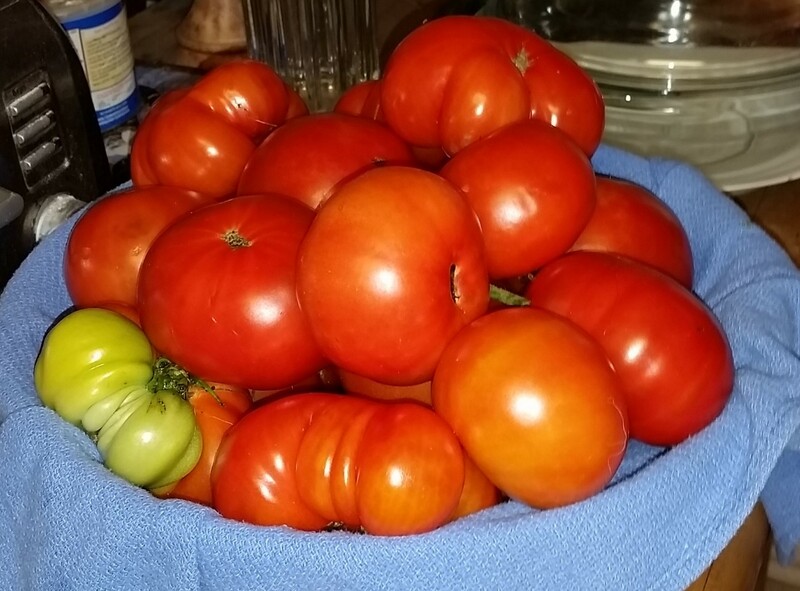 In the meantime, his home-cooked biochar will be double-dug into his vegetable beds, to enhance the soil, spur his plants to greatness, and grow a little hope from the ground up. Great article, Stephanie and Joe! I have wondered about biochar and soil fertility for some time. Today, June 12th, 2018, I read this article and plan to attend a workshop open to the public at the Leo Creek Preserve in Suttons Bay at 6pm. I look forward to working with biochar in my garden and exploring this concept with GTSI school teachers in the region as well.